Is a Comet ISON Solar Flare Possible If It Hits The Sun? Earlier this year the legendary former astronaut Buzz Aldrin announced at the Humans to Mars summit in Washington D.C that space exploration is more important than planetary defense. Aldrin’s decisive comments caused quite a stir in the media, namely because he criticized NASA’s plans to bring an asteroid into lunar orbit. Astronomy, astrology, asteroids and space travel have been hot topics in 2013 and none more so than the news that Comet ISON is coming. A sungrazing comet is an extraterrestrial object that passes extremely closely to the sun, sometimes within a few thousand kilometers of the sun’s surface. Comet ISON is a sungrazing comet which was discovered in September 2012 by Russian astronomers, Vitali Nevski and Artyom Novichonok. The discovery took place in the International Scientific Optical Netwrok not far from Kislovodsk in Russia by using a 0.4 meter telescope. 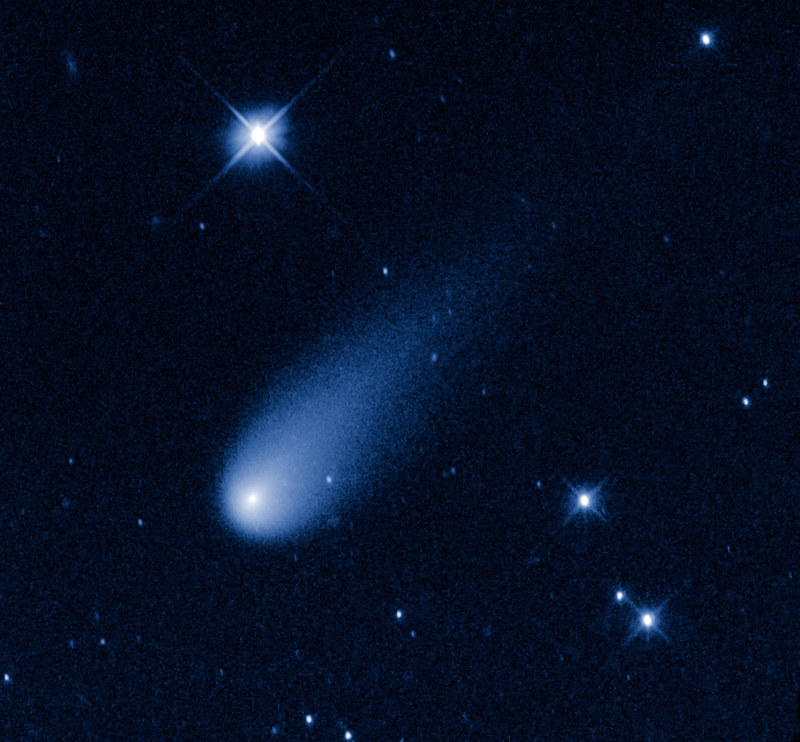 Much of the amateur and professional astronomer excitement surrounding Comet ISON – officially known as Comet C/2012 S1 – stems from the fact its orbit is near parabolic. This suggests that Comet ISON may be a dynamically new comet coming freshly from the Oort Cloud. The Oort Cloud consists of a vast number of icy objects that are predicted to circle the Solar System far beyond the orbit of Neptune. It has been estimated that the cloud extends out to a distance of approximately 4.6 trillion miles from the sun and marks the edge of our solar system. Naturally the perceived arrival of something so far away is exciting astronomers worldwide because they can provide insight about the conditions at the dark and distant edge of our solar system. Besides having the potential to enlighten us about what lies beyond, Comet ISON has promised to be a spectacular sight for astronomers. Will Comet ISON Hit the Sun? Perhaps the most pertinent question on people’s lips is if a comet is traveling so close to the sun, will it hit it? What’s more, is a solar flare possible if it does hit the sun? From a very young age we are taught that one of two things wiped out a living species that roamed planet Earth for 165 million years – volcanoes or a comet. If the latter was capable of making the dinosaurs extinct, what hope does the human race have? A solar flare is defined as a sudden, rapid and intense variation in brightness observed over the sun’s surface. A solar flare occurs when magnetic energy that has built up in the solar atmosphere is suddenly released. Solar flares can cause damage and destruction to Earth. Flares and other sun storms can have serious effects on satellites and other systems around our planet. For example, the Carrington Event of 1895 was the first documented event of a solar flare impacting Earth. According to NOAA, the Carrington solar flare caused severe interruptions in global telegraph communications. Fires were even sparked by lines igniting telegraph paper. The potential damage and destruction solar flares can cause is proven and well documented. What are the chances of Comet ISON will cause a solar flare and subsequent electronic meltdowns? David Eichler, lead author of a forthcoming paper titled “Astrophysical Journal Letters” is theorizing that a sungrazing comet with a nucleus of approximately 30 kilometers in diameter could trigger, “cosmic ray-generating shockwaves large enough to initiate a complete global electromagnetic meltdown”. Comet ISON is gathering speed as it approaches the sun. It has been a tumultuous year for comets and asteroids in 2013. In fact, meteor-mania was ignited following the Russian meteor blast that took place in Russia in February this year. Whether Comet ISON will cause a solar flare remains speculative. One thing that is more certain, when it makes its closest approach to the sun on 28 November 2013, at a distance of only 2.1 million kilometers from the sun’s surface, there are going to be a lot of astronomers out with their telescopes ready to watch the fireworks.